Fresh cider from the apple trees at our Vermont Bed and Breakfast! What a difference a few months makes! When we last checked in our flowers were in full bloom, we were swimming in the pond, and enjoying everything summer has to offer. But, this is New England and just as soon as you get fully comfortable in one season, another comes knocking at the door! I know everyone likes summer to be just a little bit longer, but I personally love the changing of the seasons. Sure, the "to do" list might not have been fully complete; but each season brings its own fun activities and events, and makes you appreciate each season in its own special way. Our guests enjoy local treats from close to home, like cider from our apple trees! Shortly after our last blog post we acquired an apple press in order to make our own apple cider. We spent a few days exploring the apple trees scattered across our property and collected a few large barrels of apples. After that we got to work grinding them up and pressing them into delicious apple cider! The first batch came out a little tart, but we are still perfecting our recipe! As an added bonus, we gave all the leftover ground up apples to a local farm down the road to feed to their goats! We have a wide variety of heirloom apple trees on the property at our Vermont Bed and Breakfast! Also this fall we made a quick afternoon trip over to the East Charlotte Tractor Parade. A truly Vermont event, the parade and festival is timed around the end of harvest season and features a pie eating contest, local vendors and music, and the main event: a stream of about 200 tractors of all sizes and ages rolling down the street. On the way home we stopped in at a family run apple orchard and I had one of the best apple donuts of my life! It had just come out of the fryer so was nice and crispy, then they put it in a dish and topped it with a maple creemee. A tractor parade, cider donuts and maple creemee? I'm not sure how more Vermont you can get. I think I was even wearing a flannel shirt! Quite the festive scene at the East Charlotte Tractor Parade! Fresh snow at our Vermont Bed and Breakfast! Sure enough, Mother Nature decided we had enough of fall and decided it was time to throw some winter at us. It was an unusually snowy November here in the Green Mountains, but in my book a fresh blanket of snow is just as pretty as the flowers we grow all summer (and i don't have to work for it!) Vermont is a skier’s paradise right now with relatively moderate temperatures and a thick blanket of fresh natural snow. Snowed in at our Vermont Bed and Breakfast! If snowshoeing is your preference (as it is mine) we have begun to carve out a network of trails across our property so guests can get out and enjoy themselves! We'll have some hot cocoa ready for you when you get back! With the holidays approaching and the end of the year upon us, we have been spending some time reflecting upon what an incredible time we have had this year at the Bed and Breakfast. Through the seasons, we continue to be grateful for the incredible guests who we have met since we opened our doors in 2015. Thank you! We are full of good cheer and the magic of Christmas! Wishing you the best this holiday season, from our family to yours! It’s been a while since we have updated the blog, mostly because the summer is such a full, verdant, vibrant time to be here. It’s been a hot summer and we have spent a lot of time outdoors appreciating the beauty and working on projects outside to improve our guests’ experience. So much has happened since our last post! In a quick recap of summer, everything is in bloom and we are extending the boundaries of our gardens to make room for new flowers and crops. Luke has put in 8 new flowers beds in the lower field, and his plans include spring, summer and fall blooming flowers. It really has been a joy to see them bursting out in a colorful array. We are excited to experience each new season and the surprise of flowers that pop up in the freshly tilled soil. Luke has added new flower beds in the lower field, where every season we enjoy new blooms! Dahlias are some of our favorite summer blooms! I’m coming to realize that we just don’t have enough vases for all of the flowers that are adorning the property. It has been such a rejuvenating experience each week to fill a bucket until it is brimming over with flowers to make bouquets for every room. In true form, the square footage (or acreage) of Luke’s gardens grow by 20-30% every year. What started as a 10x10’ plot has grown to 5,000 square feet. I think next year we will have to start a little flower stand or bring them to market, as they are so beautiful and abundant! Foxgloves bloom in the lower field, where Luke has planted a cutting garden. Our chickens have learned how to escape their coop and we love seeing them explore free-range, enjoying the fresh food available in the garden and yard. They have gotten braver and friendlier with each day, where now you must close the doors and windows of your car or they might take it up as their new roost. I absolutely love them. As I write this, they are hunting and pecking around my feet at the pebbles of our outdoor patio. Now that they are exploring a wider footprint of the property, we sometimes find their eggs on the lawn, which brings back all of the joys of childhood scavenger hunts and Easter egg parties! Our friendly little chickens enjoy exploring the property at our Vermont Bed and Breakfast, free-range! The Bed and Breakfast has been busy and we have loved seeing returning guests, who we are happy have enjoyed their experience enough to come back – some have even brought friends on their return journey! We have had a few long-term stay guests and it has been fun to get to know people better and see them feel at-home as guests at our Vermont Bed and Breakfast. Guests at our B&B enjoy a cup of tea or coffee and the view from our Vermont Bed and Breakfast. One project that truly excited me to accomplish was the addition of a tiny free library, which guests can enjoy as they walk the path around the pond. Placed just next to a mossy rock, it’s the perfect place to read a little poem or reference a bird watching book to see what species just flew by. As I write this, a hummingbird stopped by to visit the zinnias and enjoy their sweet nectar. I find that if you are quiet for a moment here, you are bound to see something awe-inspiring. Check out the books in our new tiny free library! It has been a fun and delicious experience to enjoy the berries and fruit that grow on the property. We had a very healthy crop of currants this year and the walk around the pond easily becomes a feast when the raspberries are in full season, as they were earlier this month. The blueberries are still a little young to harvest but are starting to show the signs of fruit development and hold promise for next year. Our next big crop will be apples, which are starting to blush a beautiful pink. Our dog, Stout, is starting to visit the apple trees to snack on the sweet and tart treats. Summer is winding down and we are savoring every day that we get to play outside and enjoy this beautiful place. Fall foliage is starting to turn and we are looking forward to the crisp air and coziness that autumn brings to New England. We are so grateful to live here and share this experience with guests at our Bed and Breakfast. For those winter travelers looking for an outdoor activity this winter that is easy on your budget and will get your heart pumping, we have a secret in our backyard. Since the Appalachian mountain “gaps” or highway passes over the Green Mountains close over the winter, they make a great avenue for winter hiking and advanced sledding. A great place to try out winter hiking and sledding is Mount Philo. Looking out over the Lake Champlain basin, the little knoll in southern Chittenden County offers epic views and a fun winding trail up and down the hill. After sliding down, we recommend that you have a pint (or growler) at Fiddlehead, a pie at Folino’s Flatbread, or go for a wine tasting at Shelburne Vineyard. For those adventurers brave enough to give it a try, the section of road that traverses Lincoln and Warren, known to locals as the Lincoln Gap, is worth every heartbeat of the hike up and the adrenaline rush down. Some come to sled, others to back country ski, and some even to hike up on snowshoes to Mt. Abraham (accessible by the Long Trail which runs across the top of the pass). I recommend using a hard plastic sled or a “jump jack” reconfigured ski sled, rather than an inflatable tube, as you can better control the speed and direction. The 20% grade is ridiculously steep, and at the top, it pitches to a punishing 24% grade. The pitch of the mountain road will really get your speed up, so it’s important that you wear a helmet. Clearwater Sports in Waitsfield rents Mad River Rocket sleds for $15/day. They also offer a guided “Rocket-Shoeing Adventure” snow-shoe-and-sledding day trip up Lincoln Gap with the rocket sleds for $55/person. When you’re ready to warm up, we recommend getting a pint at the Bobcat Café or setting up at the delightful bar at Mary’s Restaurant, in Bristol. For guests who want to relax by the fire at our Vermont Bed and Breakfast, the new owners at the nearby Jerusalem Corners Country Store have revamped their menu and now offer delicious pizza, soups and sandwiches to order. Winter is a great time to visit because the tourism scene is quieter and the local-food scene is always in season. There are great beer and wine tours nearby, and guests can enjoy tasting the artisan flavors of handcrafted spirits. Many of our guests inquire about visiting local cheese makers and we are excited that the International Cheese Festival has just announced their 2018 festival dates, August 11th & 12th. You can also explore our interactive google map to view listings of local cheese making farms and tasting rooms. We are also looking forward to the upcoming Maple festivals that make visiting at this time of year extra sweet. Need an excuse to visit? We’ll be happy to help you craft one. When Carin and I moved into this house in early 2015 we moved into our dream home. The first day we looked at it there was a fresh blanket of snow and the sky was so clear that the peak of Camel's Hump mountain was so defined it was practically calling for us to go hike it. On the spine of the Green Mountains to the right, you could almost see the top ski lift of Mad River Glen spinning around. We walked in the house and were met with the large field-stone fireplace in the living room and we had the same reaction I'm sure many of our guests do; that of relaxation, tranquility, and (for us anyway) a desire to spend the rest of our lives here. A snowy day at Vermont Bed and Breakfast at Russell Young Farm. The hearth in the Great Room, at Vermont Bed and Breakfast at Russell Young Farm. Interestingly, this house didn't always have that fireplace we love so much, or even the front porch. When this house was first built in the 1870's it resembled more of a small Cape Cod style house sitting on a fraction of what is now a rather large footprint. The Young family, Luthera and Russell, first moved to the property sometime shortly thereafter and worked the 500 acre property adjoining the house. They maintained a heard of milking cows, and a large barn across the street where the town road turn-around is located today. Each morning they would milk the herd by hand and put the milk in the shed across from the house, where it was kept cool until it could be picked up. There was a second carriage barn behind the house where a small shed now stands. One of their children, Ralph Young, was born in 1925. When the Young family moved on, and the farm was no longer being worked, the house underwent a few major renovations. It's unclear exactly when, but somewhere along the way the house was expanded to accommodate a larger living room, and a full second floor was added. At some point in this time frame the field stone fireplace was added. The entire front of the house was re-worked to have an almost Greek-revival feel with pillars stretching from the ground all the way to the roof. For some time, the house itself was being used as a ski dorm with several small rooms upstairs. We have enjoyed having some of the former residents' family come and stay with us. Hearing their stories and memories of the place has been a gift. Over time, the majority of the land was divided and the house went back to use as a single family residence, until the early 2000's when another major renovation took place. The porch was reconfigured to take advantage of the beautiful mountain view. The pillars were boxed in to create two large guest rooms upstairs and the entire back half of the house was added on, where the kitchen and garage are today. We are fully aware that this house has significant history. Not just for the individuals who poured their hearts and souls into it over the years, but for the town as a whole. As the current caretakers we want any changes that we make to not only accommodate our guests and our own future at the house, but also keeping the extensive history of the house in mind. 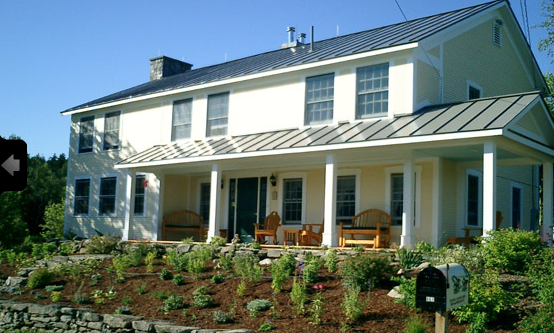 Energy efficiency renovation at Vermont Bed and Breakfast at Russell Young Farm. This spring, when the bed and breakfast is closed, we are embarking on a small modernization and energy efficiency project. All the windows and siding on the front of the house will come off so we can add some insulation, replace older windows for a more energy efficient style, and install sturdier siding. These improvements will keep our guests a little cozier in the winter, improve energy efficiency and go a long way toward extending the longevity of the house. Welcoming entryway at Vermont Bed and Breakfast at Russell Young Farm. Ralph Young, who was born here in 1925, passed away in 2014 and we hope he, and all the other former occupants of this house, appreciate the love and care currently being put into this wonderful home. We love sharing the experience that this property provides to our guests and we are happy to take good care of it and call it home. The days are getting longer, which means that skiers and riders are getting more turns in before the sun goes down. With warmer days and cooler nights, it’s time to roll up your sleeves and get a ski-tan. Our view of Mount Ellen, from Vermont Bed and Breakfast at Russell Young Farm. Don’t let the warm weather fool you—Vermonters are enjoying some spring skiing. On Wednesday, Magic Mountain had an impromptu beach bash with a grill, drinks and t-shirts on the slopes, Sugarbush tweeted about sweet, soft turns and Jay celebrated the vitamin D. There’s more to come this weekend. Here are the events to head to. At Rikert Nordic Center, watch NCAA cross-country ski racers go head-to-head. Up the road, the Middlebury Snowbowl hosts NCA ski racing. Plus, don’t miss the bonfire, olympics, ice show and carnival ball. Magic hosts its own version of the Olympics, with competitions, a silent auction, buffet dinner, torchlight parade, fireworks and live music. Free admission, free demos, guided treks and activities for all levels, plus food and drink! Ski with some of the East’s best teleskiers in this two-day festival, chock-full of clinics and free-heel camaraderie, with a classic race on Sunday. We have rooms available for guests who are looking to make the most of the ski weekend at our Vermont Bed and Breakfast. With the New Year upon us, we have been thinking about what an amazing year 2017 was. We had guests from around the world – France, Israel, and all over the United States, including a handful of guests who have come back for a return stay at our Bed and Breakfast. As always, we enjoyed visiting with our guests and helping them to experience the best of Vermont in a weekend. Since our last blog post, we have taken some time for family visits and vacation. We enjoyed an amazing trip to the Azores, which was our first trip abroad with our son, Kellen. We had such a good time exploring, and it was a great reminder of what we enjoy as travelers – good food, kind people, and quality sleep after full days of adventuring! Our Fall Foliage season was exceptionally busy this year and we are grateful that we already have a handful of reservations for next autumn. Last year, we were surprised by thoughtful gifts and gestures from our guests, who shared with us prints of their photos, wine from their hometowns, essential oils, and delicious treats from around the world! It’s always amazing to us how by opening your home you also open your heart. We love having guests and sharing the Vermont Bed and Breakfast experience with them. With the quiet season that comes after the leaves fall, we enjoyed visiting with friends and family, especially spending time together over the holidays. This is such an incredible place for reconnecting and enjoying a slower pace. In the last few weeks, we have enjoyed doing puzzles by the fire, marking Christmas ornaments and cookies, and having friends and family visit. Now that the ski season is ramping up, we are excited to welcome families who are looking for a relaxing retreat after a full day of adventure at the mountain. With both Mad River Glen and Sugarbush Resort nearby, as well as Sleepy Hollow Nordic Ski and Snowshoe Center, there are miles and miles of trails to explore in the winter. We’ve also been working on some projects at the house. Luke has more than 65 new Dahlia tubers to grow this year and I am excited for the beautiful flowers to decorate the property and bedside tables. Our seed catalogs have started to arrive and we are enjoying leafing through and dreaming of what to grow this summer. With the chilly winter months here, the chickens and ducks have slowed their laying. They are nestled in with a heat lamp and are enjoying their feather-down jackets. Luke and Stout bring them fresh food and water every day, and check that their house is cozy and warm. All is well on the farm. We are keeping the house cozy and warm and enjoying the restful pace of winter months. We hope you plan some self-care and travel into your New Year’s resolutions. We will have a room ready for you when you are ready for a getaway! We love the change of seasons here. The crisp autumn air and the smell of wood smoke as you drive through the valleys of the Green Mountains reminds us how special Vermont is. Our Bed and Breakfast has been bustling with guests from all around the world, looking not just for lodging but for an experience of Vermont in a weekend. We love recommending day trips that will help our guests to experience the most authentic, beautiful places in Vermont in the span of a weekend. We are perfectly positioned as a jumping-off point for foliage tourism, with mountain views, lakes and cultural centers within a short drive. First, we love recommending that people visit the Farmer’s Markets nearby. There are so many talented producers who are making crafts with the best cultivated fruits, flowers, veggies, cheeses, meats and drinks from the Vermont landscape. The Waitsfield Farmer’s Market is one of our favorites. We love the live music, distillery tasting, fresh cheese, Red Hen baguettes, Lincoln Peak Wine and wide variety of pickled treats! Save room in your belly for lunch at the Mad Taco and an epic sundae at Canteen. Another favorite is the Burlington Farmer’s Market, where you can fill your belly on meals with flavors from around the world, beautiful flowers, and exceptional people-watching – one of my favorite past times. We love meandering along the Church Street marketplace, where you can spend the day exploring restaurants, shops and the vibrant arts scene. The Smuggler’s Notch (route 108), known to locals as “The Mountain Road”, is a perfect adventure for those looking for a memorable trip! The top of the mountain is filled with tight turns and narrow passes, which every year poses a problem for long trucks that take the “short cut” and get stuck at the top. Guests love exploring this route – especially on a motorcycle! One of our favorite places to go as a family is to take a walk through beautiful Shelburne Farms, then enjoy lunch at Folino’s flatbread. We like to pick up a growler of beer at the next door Fiddlehead brewery before hiking up Mount Philo and enjoying the view of the Lake Champlain and the agricultural valleys around. It’s an easy hike for such a stunning vista! For folks looking for a cultural and historical experience, the Rokeby Museum in Ferrisburg hosts interesting exhibits about Vermont’s history in the Underground Railroad. Afterwards, we suggest that guests stop in at Cookie Love and enjoy some of the best cookies around or pop in and try the samples and pick out gifts at Dakin Farm. Depending on what guests are looking to do, whether relaxing here at the Bed and Breakfast or exploring the trails of the Green Mountains, there is something for everyone. We love seasonal events and activities, like the harvest festivals, pumpkin patch parties, apple picking celebrations, and brewery tour events! The calendar is always full in the fall! Planning a trip? Let us know if you need any recommendations! We have been having an incredible year at the B&B. We have been able to host some wonderful guests from near and far, and still manage to squeeze in a trip to Montreal and take a weekend off for some time with our family. Getting over the border to Montreal is always a fun little excursion for us. Only about 2 hours from our door, we spent a weekend in Old Town walking around cobblestone streets and enjoying some great poutine. If you're visiting us on your way to or from (or just making a day trip of it) we'd love to hear from you! We are always looking for good recommendations we can enjoy, and pass on to other guests. First trip North of the border! A lot has happened in the month since our last blog post! The weather has warmed up significantly and the ground has dried out. With the extra blast of heat (well, Vermont heat) our dahlias are just exploding with color! We planted 45 tubers on the bank of the pond and cannot wait to see what colors each one brings. See, last winter I labeled the color and type of each tuber, but those labels wore off, so we will have a nice little surprise as each one blooms. Our hydrangeas are in full bloom splashing vibrant shades of blue and white; and guests who sit on the porch can look out and be treated to a 40 foot long planting bed full of zinnias and sunflowers, now in full bloom. We have hosted two family yoga classes, which is a nice way to meet the neighbors and offer a community benefit. The wee ones are excited to put their feet in the grass and parents enjoy taking photos and engaging with each other. It’s been a treat! This weekend we will have a yoga class geared for adults. If you’re in the area, pop by for a stretch! The location for Yoga on the Lawn! The little fruit orchard we planted this spring is doing well. The oldest of the trees, the plum tree, is already setting fruit and a few plums have been ripening to a perfect reddish bronze color. Unfortunately, the deer have figured this out and are scooping up all the fruit before we can get to it! One project that has moved up to the top of my to-do list is setting up an electric fence around the orchard. We also have several blueberry bushes that are beginning to set fruit for the first time as well as a black currant bush that is just loaded with tart little berries. It has become a lovely family adventure to take a walk around the property and enjoy bursts of flavors at each little bush. Guests who venture around the pond can now stop and have a little snack as they explore! Fresh blueberries and currants from the bushes around the pond at our Bed and Breakfast! We are basking in the glory of full summer and invite you to join us! For a long time I’ve been thinking about how we can provide a community space for our friends and neighbors! This summer, we will be offering a few special events including Family yoga! On Sunday July 9th and August 6th, we will be hosting a free family yoga class designed for pre-crawlers through new-walkers. We invite community members to bring their little people for an outdoor yoga class. Hope for sunny weather, as it will be weather-dependent. We will have a few available but please bring a mat and blanket, if you can. We also encourage you to bring any protective layers or products that will help you to feel comfortable enjoying the lawn in the afternoon. Please help us spread the word! We hope to see you there and look forward to meeting our newest neighbors! Summer is in full swing here at the Bed and Breakfast! There is always a project to do on the farm and we are happy that the beautiful weather has enabled us to make the most of our longer summer days! Summer is such a great time to be in Vermont. Even for those of us who love winter and enjoy adventures in the snow, the change of seasons is a welcome thing in the Green Mountains. Looking forward to the next few months, there is so much to see and do that makes a Vermont getaway worthwhile - and so memorable. For the Foodies and Outdoor Adventurers, there is an abundance of fresh, local food that you can enjoy. Some of our favorite activities include attending the Waitsfield farmer’s market, ranked one of the top 5 Farmer's Markets in New England by Yankee Magazine, to pick up delicious treats to fill a picnic basket and take a hike, or go tubing down the Mad River. There are so many great day hikes in our area. My favorite hikes are within an hour of our Bed and Breakfast, and include a few hours of moderate hiking, ending with a picturesque view of the Green Mountains and Lake Champlain. Some of these hikes are even located near our favorite breweries and vineyards, so you can pick up a growler and enjoy a sunset hike! If you’re interested in cultural events, there are so events coming up! The Discover Jazz Festival takes over Burlington in early June, with world-class musicians and performers filling the venues across town. Higher Ground brings top-line musicians to perform live in their venue, at the waterfront, and at Shelburne Museum. Check their calendar early to reserve tickets to one of the upcoming shows! The Church Street Marketplace comes alive the summer, with restaurant seating spilling out into the pedestrian marketplace. It really is a celebration of the season of sunshine! There are other annual celebrations that take place in the summer, like the weekly Farmer’s Market, Kids Day and Festival of Fools (Circus Arts), to name a few. Shelburne Farms hosts the Vermont Cheesemakers Festival every year in July, and I can’t think of a better setting to enjoy local food and learn about the rich history of Vermont agriculture. Some of the world's best cheese is made in Vermont, and you'll know what makes it special when you see the beautiful landscape and hardworking people who make it. One of my favorite things to do in go out on a sunset sail with the Whistlingman, on Lake Champlain. Sailing towards the Adirondacks, you look back at Burlington as it sits glowing in the evening sun, with the beautiful Green Mountains in the background. You can pack a picnic on the boat, which has a capacity for 12 people. It’s a perfect way to enjoy an evening. When you land on the docks at dusk, you can walk up to the Church Street marketplace and enjoy some of the best bars and restaurants in the area. If you’re needing a getaway this summer, there’s no better place than Vermont. Some of our guests don’t ever leave the property – they enjoy a leisurely breakfast, have coffee on the porch, read by the pond, stroll around the property or practice yoga with a view! We love it here and we are so happy when our guests enjoy themselves, either by exploring the nearby attractions or settling in for a quiet weekend retreat at our B&B. Summer is the perfect time to visit Vermont and make the most of the local food, beer and wine, outdoor adventures, and cultural events. We hope you will come and see for yourself! Verdant Vermont: The Growing Season Begins! It's been a little over a month since our last blog post and things have been happening fast around here! As we mentioned, we have started our own little fruit orchard in one of our fields. So far we have 5 Peach trees and 4 Pear trees planted, and we have 2 Plum trees sitting in the driveway waiting for the yard to dry out a little so we can drive over it without making a mess of the lawn. Eventually we will get a 3rd Plum tree to make the orchard a little more symmetrical, but that may wait until next year. Hopefully if all goes well in the next few years we will be whipping up some peach cobbler or plum preserves... or perhaps some Perry? (Pear Cider.) We are excited to add new fruits to the breakfast menu at our B&B and serve local fruits that we have grown on the property! Food is better when it's so fresh you can still taste the sunshine! Our new plum trees, making their way to the orchard! Seedlings, safe and warm inside! The little seedlings we started a few months ago are itching to get into the garden. Admittedly, I started them too early. Last year, by this time, things were dry and pretty warm. This year things are still a little too soggy, and the nighttime temperatures are still dipping a little too low to get them out. (Chilly nights make for great sleeping weather!) But that's OK, they are perfectly cozy in the little greenhouse with all of their friends. Eventually the peppers and tomatoes will be placed in the garden under the gardening hoops you can see in the picture below. Then a white fabric gets stretched over the hoops and secured. This will keep the plants warm, and protected from the elements while they get settled in and grow roots. The greenhouse plays a key role in keeping our plants safe and warm in the early season! While we grow 100% of our vegetables from seed, space in the house, as well as time commitments on the part of yours truly, prevents us from growing everything from seed. While we still grow a fair amount of flowers from seed, including zinnias, sunflowers, and petunias; and divide and overwinter our dahlias every year, there are some things we rely on local greenhouses to provide. This last weekend we were visiting family down in the Lebanon, NH area and stopped by one of our favorite nurseries, Edgewater Farm. We picked up some basil and mint for the wonderful breakfasts we will be serving up, and we also picked up some impatients for the flower pots on the front porch. I also snuck some creeping phlox and delphinium into the shopping cart for around the pond. I can't resist flowers! We prepare the soil with compost, then overlay it with ground cover to keep the weeds down without using chemicals. The hoops are covered with fabric to provide shelter to young plants in the early season. Over the next few weeks all of this will be going into the ground and the property will start showing it's true colors. I can't wait! I've said it before and I'll say it again. Spring is my second favorite season in Vermont. And it's a very close second. There is so much going on here at the farm in late March and early April! The landscape is coming to life, and we are getting busy with preparation for yet another successful season at our Bed and Breakfast. We try to be fairly self-sufficient at the B&B. We have our own flock of chickens and ducks for eggs, we make our own maple syrup, and we try to grow most of our own fruits and veggies we use around the bed and breakfast. Back in mid-February we had a good run of weather to collect maple sap, which we boiled down into a few gallons of syrup. Right around the same time I started a whole bunch of pepper and tomato seeds. This is pretty early to be starting any kind of seed in Vermont, but as you'll read later on we start early because we take some precautions in order to set plants out a little earlier than normal. (Normal for our mountainous area is right around Memorial Day.) Anyway, after we boiled some sap and started some seeds, mother nature had a good laugh at us and it turned cold and snowy again. The sap stopped flowing and I questioned my sanity starting so many seeds early. Then, at the end March, we saw Robins so heavy with eggs they could barely fly, and those that had already laid their eggs were busy searching for food to feed their hatchlings. Spring had officially arrived at the B&B! By now the temperature swings are perfect for maple sap collection and those seeds I planted in mid-February are about 6 inches tall. We keep them under a combination of LED and fluorescent lights near one of the baseboard radiators to keep some heat in and they love it. They will soon outgrow their 4 inch pots, as well as require more light than we can give them indoors. Just today I went out and shook the cobwebs out of our little 6 foot by 6 foot greenhouse. In another week or so all of the large seedlings will move out to the greenhouse where they will enjoy 80 degree days and a small electric heater will keep them at around 50 degrees at night. With almost two months until our official "plant out" date, how can we keep them in pots for that long you ask? Well, as soon as the ground thaws out a bit in the garden we will go out and cover it with black fabric, and then cover a few areas with row cover, or a mini hoop-house. This will heat up the soil where plants like melons, peppers and tomatoes are planted; and it will also provide up to 7 degrees of frost protection at night for the seedlings. With this system, we can plant up to two weeks earlier than normal Vermont gardens. I will collect some sap today, and then tomorrow I'll take down all of our taps and buckets until next year. Taking the buckets off the trees is always bittersweet for me; while i love the process of collecting and boiling, by the time they are ready to come off I'm usually ready to move on to other things. Tending to the garden, planting the annual flower beds, regular maintenance, and this year we are planting an orchard with peaches, pears, and plums which should all be arriving in early May! Stay tuned for more on that later. In Vermont, there’s something for everyone and planning your visit at the right time of year can make a world of difference as to how you experience your getaway. Planning your trip during the shoulder ‘in-between’ seasons can provide a more intimate experience of Vermont’s area attractions. Now is the perfect time to start planning your Vermont vacation. 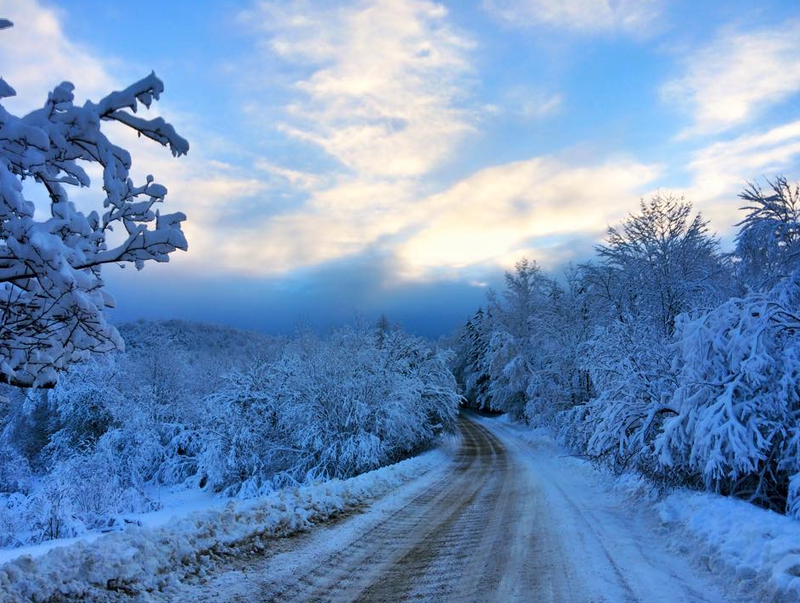 Late winter is a sweet time of year to experience Vermont. Whether you’re getting first tracks on Vermont’s many ski and snowboard trails or visiting apres-ski events at the many breweries and local-food sourced restaurants, it’s a great time to visit. For those interested in history, culture and craft hobbies, visiting Vermont in February or March, during the Maple sugar season, is a sweet and memorable experience. Many farms open up their “sugar shacks” for maple syrup tastings. There are plenty of birds to watch at the birdfeeders. With nights below freezing and sunny, warmer days, maple season is a nice time to spend the day snowshoeing, touring maple production, and sampling some of the local cheese purveyors. Plan your visit for the start of the growing season and you may find that you have a private B&B getaway. Visiting in early May, you’ll experience everything in full bloom. The countryside will be filled with the scent of blossoming trees and flowers. On many farms, baby animals will be venturing out to pasture and kicking up their hooves and feet for the first time. Many farms have events to meet baby lambs and goats. A visit to small-town hardware stores and you can see fluffy little yellow chicks, ducklings and goslings, heading to area farms. What could be cuter? Late August through mid-September is a great time to experience the bountiful Vermont foodie scene, as farmers are harvesting their crops and producing craft treats with local ingredients. The swimming holes are still open, while not being too crowded for a dip in a mountain stream. As a visitor, you can experience all of the verdant landscapes of the Green Mountain state before the foliage season peaks and restaurants fill with tourists. Don’t forget to check the local concert listings, as there are many outdoor music festivals that showcase world-class musicians in a beautiful setting. Beer and wine flow all year long, and the weeks between foliage season and the first snow is the perfect time to plan a relaxing getaway in Vermont. “Stick season”, as the period after the leaves fall off the trees is called, is a great time to pick up a growler of local beer and hike the Green Mountains to enjoy the clear view and crisp air. After adventuring outside, many of our guests enjoy cozying up by the fire and reading a book or playing games. No matter the season, you’re bound to find something to suit your interests so don’t delay in planning your Vermont getaway. If you have questions about planning your trip, take a look at a few of our favorite spots or feel free to contact us. We’ll be happy to give you an insider’s view to guide your travel plans. If you've been following our instagram or facebook pages, you've probably seen a picture of our pond with a dock on the side opposite the house. The dock has provided great entertainment to many friends and guests. We've had people fishing off of it (with no luck) jumping off of it (no diving please!) and we are still trying to convince our dog to take a splash off of it. But one thing has become clear: the dock is tired. It's seen many seasons in the sun and it needs a little love. Nobody is really sure how old it is but we have some pictures dating back about 30 years and the dock is in them, so it's safe to say it's been well loved. In the intervening years the snow and rain has taken it's toll on the lumber, fasteners aren't fastened anymore, and a ladder that used to be fixed to the side fell off long ago. We figured it was time to breathe new life into it, and get it back to it's full glory. We figured the easiest way to work on the dock would be to wait until the ice froze solid enough to get out and walk on it, using it as a scaffold of sorts. Sure enough, just before Christmas the ice was pretty thick and I ventured out with a sledge hammer and had the old dock in pieces within a few minutes. Unfortunately, then the weather stopped cooperating. It rained, it got warm, and the ice was no longer suitable to work on. Eventually, after a nice long freeze, we were able to get back out and rebuild the dock off of the existing pillars. As with every building project I embark on, I have an idea in my head, and some rough drawings on paper, but I never stay committed to any one design. Our old dock consisted of two long beams that sat on top (mostly) of the pillars, and then some decking was fastened to the beams. Over time, the connection between the beams and the pillars failed and the whole thing was pretty much just floating. We decided to build the new dock six inches closer to the water, and place the beams adjacent to, instead of on top of, the pillars. We reasoned this would give us something extra to fasten the beams to and make the whole thing a little more stable. After bolting some supportive cross beams to the pillars, we erected 24 foot long beams on those supports and then fastened bracing in between to make everything square and rigid. After that it was simply a matter of fastening down the decking boards. We have not fully completed the decking because once the ground thaws we'll need to go out and work on the footings for the dock on the bank, but otherwise all it need is a few lounge chairs and someone to jump off it! We love to grow flowers to put on the breakfast table or in our B&B's guest rooms. Even in the dead of Vermont winter, we are starting seeds or planning the flowers to plant in the seasonal garden beds. It takes some love and care to keep the gardens in line. During our last post we mentioned that our Dahlia tubers that we placed into storage this winter began to mold a little and were generally not doing well. We are going to devote an entire post to Dahlias because not only do they add a huge burst of color to the Bed and Breakfast property every summer, but this flower in particular holds a special place in our hearts. Dahlias run the gambit from small, 1 inch diameter flowers on short stems; to flowers the size of dinner plates on massive stalks that need stakes driven into the ground in order to support their weighty heads. Whichever type of Dahlia you choose, they run the rainbow spectrum in color and eye popping appeal. This is why they line the banks of our pond and adorn the nightstands of our guestrooms when they are in season. Dahlias do, however, have one major drawback for Vermont growers. Native to Mexico, Dahlias are closely related to the Zinnia and Sunflower. Needless to say, they are a very tender annual and do not handle cold very well. While Zinnias and Sunflowers are easy to grow from seed each year, the Dahlia's root system is a group of meaty tubers that take time to become established. Therefore it isn't as easy as throwing a bunch of seeds in the ground each spring. Dahlia tubers can be purchased from any mail order seed catalogue, or even purchased at your local hardware store; but if you live in a climate such as ours, and you want to save your favorite Dahlia plants from one year to the next, certain precautions need to be taken so they can thrive in a Vermont garden. At the first signs of frost their hearty stalks turn black with winter chill and they begin to die off. Before that frost reaches the ground, we snip off the blackened stalk and use a pitchfork to loosen up the soil around the mass of tubers. Once we can extract the tubers from the ground we rinse the mass off with water and set them out to dry for several days. The reason we had some mold popping up on our crop this year was twofold: I was impatient and didn't let them dry enough before putting the tubers into storage; and the storage container I placed them in did not have enough ventilation holes. Dahlias adorn the Blue Spruce Room bedside table. Since there is a good 6-7 month stretch from killing frost to spring planting, these Dahlia tubers actually spend most of their life in storage, which means we need to be very careful about how and where they are stored. In years past I've placed them all in a cardboard box, separated by thin layers of newspaper, and placed them in the basement. This works well for many but here at the B&B our basement stays a little too warm. Ideally, they should be in storage conditions similar to a root cellar. Chilly, but never frosty. To meet these special conditions, our Dahlia tubers get stored in our garage for winter. I wanted to upgrade from the cardboard box to something more substantial this year, so we went out and got two large plastic totes to store everything in. Since Dahlias need to breathe, I drilled a few holes around the sides and top of the totes, and stored them just like I always had: with just a few pieces of newspaper in between them. After two weeks I went to check on them and lo and behold: MOLD! I knew right away what had happened. In the short time that they had been in storage, the extra moisture in the tubers came out and the few holes and sparse packing material were not enough to wick away the moisture. We were able to save them just in time! They all came out, got sprayed with 1:10 bleach solution, sat under a fan for a week, and we re-packed them for a long winter’s nap. This time I drilled many more holes in the containers and used a bag of pine shavings to pack in between the tubers. You want your packing material to pull extra moisture away from the tubers, but not pull TOO much moisture away from them. So now they sit in our garage. I make a point of checking them every other week to make sure they are still doing well; and waiting for their chance to be planted and enjoyed by our guests for another season. We love providing fresh food to our Bed and Breakfast guests, so this year we decided to raise ducks and chickens. In May we picked up three day old ducks that we had ordered in the spring from our local hardware store. When we put in our order we were not able to specify whether we wanted male or female ducks, we were only able to order a "straight run." Since we only wanted females for egg production we hedged our bets and ordered three ducks, hoping for at least one female who would produce eggs for our breakfast menu. Duck eggs are particularly rich and good for baking. In addition to being larger than a chicken egg, ducks lay their eggs all year round, while chickens tend to slow down in the winter months. It takes a few months for either bird to develop to adolescence and start laying. We were hopeful that the cute little ducklings would turn into a brood of layers so we could make delicious breakfast breads and muffins! Zucchini Apple Bread, made fresh from the farm! As the weeks passed our little ducklings got their voice and started speaking to us. Not a distinct quack, but a shallow raspy honk almost. From everything I had read this was a telltale sign that we had males. Hoping for at least one female we waited a few more weeks for their full feathers to come in to find out exactly what we had. Sure enough, as their full feathers came in we saw a distinct curled feather on each of their tails. We had three drakes. No eggs would be coming our way. The little ones, on their their arrival day! After doing a little research I found out that when customers order from hatcheries, hatcheries fill the order for females or males first, then they fill the "straight run" orders after. Since a lot of customers are in it for the eggs, the female ducks get ordered first which leaves the straight run orders largely male. Since the local hardware store only fills orders for straight run ducks, I knew we would be in the same situation next spring if we ordered more. So, in early September I made a bold choice and special ordered four female ducks from a hatchery. Taking a field trip to meet the neighbors! Our four female Pekin ducklings shipped from Metzer Farms on September 6th, and they showed up at our Post Office on the 8th first thing in the morning. It's only been a few weeks but I can already hear a difference in their voices from the males. They are nearly fully feathered now and can go out and join their mates on a full time basis. Enjoying the grass and pool on a sunny day! We started out by housing them in the shed under a heat lamp with some supervised time with the other ducks and chickens. Now they have full run of the coop but are still finding their way around. They haven’t yet figured out how to climb back up the ladder to their house, so every night we collect them by hand and make sure that they are tucked in, cozy and warm under the heat lamp in their house. As the nights get colder, it’s a bit of race to see how quickly their full feathers come in. The little ones enjoy the heated lamp at night, while their mates prefer to sleep outside under the stars. The little ones are getting along well with the chickens and other ducks. We’re hoping they will figure out how to climb the ramp into their house on their own but until then, we’ll continue to make sure they are cozy and warm before we turn in for the night. Local Food, Beer, and Art: VT Festivals and Events Round Up! September is such an exciting time to visit Vermont. Not only are the gardens and restaurants teaming with artisanal fresh fruits and veggies from the harvest season, but the bite in the air reminds locals that winter is coming. The leaves are starting to change, the sky is clear and the air is crisp. With this, it’s a great time to visit and attend some of Vermont’s many festivals and celebrations. Bringing together local artists, innovators, and great local food and beer, the South End Art Hop showcases the exciting development of Burlington’s Pine Street corridor. This award-winning event brings visitors and locals to explore the Southern part of the city on foot, exploring galleries and live performances with over 500 participating artists at over 100 locations. Stroll, bike or roll on through Burlington’s Old North End on this day dedicated to actively exploring the northern sections of Burlington. Activities for kids of all ages! Every year for the past six years, Grace Potter & Higher Ground Music have put on a concert series along the shore of Lake Champlain. With new performers filling the stage every year, it’s an annual treat to hear great music in such a beautiful setting. Children under 12 enter for free. Their parents enjoy local brews and mountain views while rocking out to timeless music. This wood-fired flatbread joint offers up local, seasonal fare and brews their own Zero Gravity beer, as well as showcasing a wide variety of bottles and draughts from around the world. On September 21st, the restaurant will spin the globe to offer traditional German Style Music, Beer and Food. Enjoy local beer, food, music and a great vibe at Mad River Glen. Over 24 brewers will be featured and tickets are limited, so be sure to get ‘em if you can. Did we mention, it’s pumpkin spice season? Take a Hay Ride to our Pumpkin Patch to Pick Your Own. Enjoy Pumpkin Pie, Pumpkin Donuts, Pumpkin Fudge, our own Apple Pies & Cider. Children will enjoy Pony Rides, Petting Zoo, Face Painting, Fall Games, Kids Bouncy Castle & Corn Maze. With Fall foliage popping across the Green Mountains, what better to do than take a drive through the scenic byways and enjoy the art scene in Stowe! 200 juried artisans exhibit and sell a wide range of contemporary and traditional craft work as well as original Art, photography, sculpture, and specialty food products. There is a fabulous food court serving a wide range of localvore items: Organic wood fired pizza, grass fed burgers, lobster rolls, soups and salads, sweet potato fries, local apple cider, tacos, pulled pork and all the trimmings, grilled cheese Paninis, and so forth. In addition the Vermont Beer Cheese and Sausage tent returns for the fourth year. A dozen Vermont beers will be served along with Vermont cheese and sausages. Yum! Film lovers flock to Vermont for the 10-day Vermont International Film Festival. Featuring film projects from around the world, it’s a great opportunity to explore new cultures and enjoy the arts, both near and far. We hope you'll come and enjoy the best that Vermont has to offer. Let us know if you have questions about planning your trip. We're happy to make our guests feel at home while they explore our beautiful backyard and all of the cultural and culinary offerings of the season. Once Stout starts visiting the apple trees we know ripe fruit isn't far behind. So this morning I am looking up new Apple breakfast recipes we can try, and find some really good ones for our guests. So not only will our fall guests get some great apple products served up but they can enjoy a walk around the property and pick their own fresh apples while enjoying the fall foliage and views of the mountains. If our guests are really lucky, Stout might even show you her secret tree. Green Thumbs Up & Super Local Food! We've been enjoying fresh from the garden lettuce, peas, carrots and broccoli. In the next few weeks we will have tomatoes ripening, and all of the squashes will be the right size for picking. We will also pull up the garlic and begin drying it out. Now, it's time to craft some new breakfast menu ideas with all of our fresh fruits and veggies!